The Fondazione Massimo e Sonia Cirulli will open its doors in San Lazzaro di Savena, near Bologna, on Saturday, April 21. It is a new private cultural institution, born thanks to the efforts of Massimo and Sonia Cirulli and their important archive of 20th century Italian culture, established in New York in 1984 and strong of its several thousand art objects. The goals of the Fondazione are the promotion, at a national and international level, of 20th century Italian art and visual culture through a reconsideration of its unprecedented and multidisciplinary heritage; and the development of projects aimed at disseminating the knowledge of Italy’s creative culture from the birth of modernity and the concept of Made in Italy to the years of the post-war economic boom. The opening of the Fondazione will coincide with the inauguration of the exhibition Universo Futurista, curated by Jeffrey T. Schnapp and Silvia Evangelisti. The exhibition focuses on the nucleus of artworks in the Fondazione’s collection that best represent the historical period in which Futurism thrived (1909-1939), a time in Italian history that never ceases to generate debates among scholars and the general public, through exhibitions and books. The exhibition includes a selection of artworks from the collection of the Fondazione Cirulli, and seeks to highlight some of the central themes of futurist aesthetics: the futurist celebration of creative vitality, of playfulness, and the fantasy of an art that, to put it with the words penned by Giacomo Balla and Fortunato Depero in their 1915 Futurist Reconstruction of the Universe, “makes the world happy by recreating it integrally”. Futurist aesthetics finds its origins in a novel approach to the conception of artistic creation, which moves beyond the boundaries of traditional fine arts and seeks to embrace daily life in its totality, in order to become a “total art” that might engender a new bond between art and life. 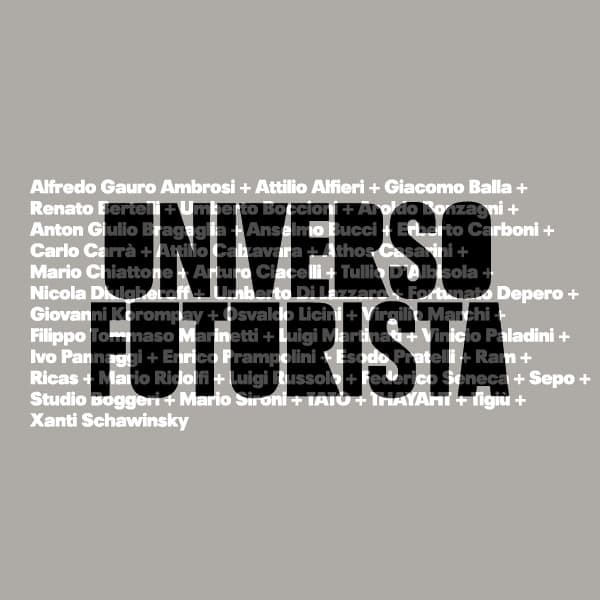 Universo Futurista illuminates this new aesthetic conception through an accurate choice of painting, sculptures, design objects, architectural projects, photographs and photomontages, advertising posters and original documents of all kinds that futurist artists created between 1909 and the end of the 1930s. Thanks to the extraordinary variety of the artworks preserved by the Fondazione Cirulli, the exhibition will offer a number of different “environments” dedicated to various themes frequently at the center of Futurist discourse, such as ideas of speed, energy, progress, mechanical men, interior design; these environments are supported by five principal structural units: a space dedicated to the conquering of skies, a wall of futurist manifestos, a series of 8 thematic areas, 6 monographic spaces dedicated to important futurist authors well represented in the Fondazione’s collection, and two spaces built around interior design and original Futurist furniture. As American scholar and exhibition co-curator Jeffrey T. Schapp explains, this exhibition project does not follow a traditional art historical format, but rather seeks to offer an exploratory pathway through the rich and diverse materials that make up the Foundation’s collection,emphasizing varied rhythms, clusters, constellations, shifts in scale from the big to the small, the busy to the spacious. The exhibition inlcudes over 200 artworks which encompass a great variety of media, formal solution, and measures, created by artists such Balla, Boccioni, Bonzagni, Bucci, Casarini, Chiattone, D’Albisola, Depero, Diulgheroff, Guerrini, Korompay, Licini, Marchi, Marinetti, Masoero, Munari, Prampolini, Russolo, Schawinsky, Sant’Elia, Sironi, Tato, Thayaht. Universo Futurista includes masterpieces with an incredible history, such as Giacomo Balla’s Disgregazione x velocità (1913). Published in Boccioni’s pivotal book Pittura e scultura futuriste in 1914, the artwork was exhibited in the United States in 1915, in occasion of San Francisco’s Panama Pacific International Exposition, a major event that featured over 11 thousand artworks from the United States and Europe to celebrate the completion of the Panama Canal. At the end of the Expo every trace of Balla’s artwork was lost, only to resurface a few years ago in the United States. One of the urban-themed paintings by Osvaldo Licini in the exhibition also presents an interesting story: as the painting was being cleaned, restorers discovered a newspaper clipping hidden underneath the frame. It was an article from Bologna’s newspaper “Il Resto del Carlino”, dedicated to a futurist exhibition from 1914 that took place over the course of a night and a day in the underground rooms of Bologna’s Grand Hotel Majestic (known back then as Baglioni). The exhibition included the work of five young artists: Giorgio Morandi, Severo Pozzati, Giacomo Vespignani, Mario Bacchelli and Osvaldo Licini, who exhibited, among other works, the very one referenced above. Lastly, Alfredo Gauro Ambrosi’s canvas, The Atlantic Squadron Flies over Chicago (1933) belonged to Filippo Tommaso Marinetti and was part of his personal collection, and was exhibited in the Prima Mostra Nazionale d’Arte Futurista (Rome, 1934). The exhibition will also include sketches and previously unseen architectural projects by Antonio Sant’Elia; Boccioni’s pastel Nike, Vittoria dell’Aria (1913); a selection of dynamic photographs by Anton Giulio Bragaglia (circa 1915); the first and only poster of the futurist film Thays (1917), designed by Enrico Prampolini; photos and collages from Bruno Munari’s Futurist phase; the previously unpublished living room furniture that Tato (Guglielmo Sansoni) designed in 1930 for Italo Balbo; tapestries by Fortunato Depero and Enrico Prampolini, from the 1920s and 1930s. The exhibition takes place in San Lazzaro di Savena, near Bologna, in a building that architects and designers Achille and Pier Giacomo Castiglioni designed in 1960 for Dino Gavina and Maria Simoncini. The building has been restored conservatively, in adherence with the original vision of the architects, and with minimum interventions that make the space adequate with its new public life. The original cotto tile flooring has been preserved, while parapets and staircases have been improved in accordance with current safety laws pertaining public buildings. The exhibition setup is particularly careful in maintaining the original spaces of the building unencumbered and visible, so that visitors may enjoy an immersive experience from both an artistic and architectural perspective. The exhibition’s spatial and graphic design are curated by Daniele Ledda, xycomm, Milan, and Elisabetta Terragni, StudioTerragni Architetti, Como, New York. The exhibition is open to the public until November 18, 2018. It is accompanied by a catalog, published by Daniele Ledda, xycomm, Milan, with essays by the curators and notes on the artworks. Texts by Pierpaolo Antonello, Silvia Evangelisti, Nicola Lucchi, Ara H. Merjian, Marco Sammicheli, Jeffrey T. Schnapp.